My Sis is an expert in creating arts and crafts from the waste materials. She participated in a competition two weeks before which was conducted by her employer. She prepared an excellent flower vase from the coconut shells. Since the announcement for competition made at last moment, She was unable to collect sufficient number of coconut shells to create her art work. So, she bought few coconuts from the nearby shop. I suggested her to get dry coconuts, so that she can remove the coconut easily from the shells and I can also prepare some recipes using it. In fact the storing of the dry coconut is easy than the fresh one. 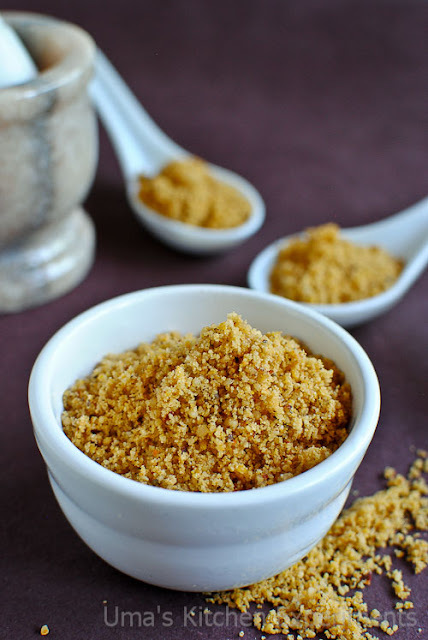 I made use of one entire dry coconut for making this chutney powder. My mom makes the same powder using fresh coconut and prepares it in small quantity every time as it has very less shelf life. 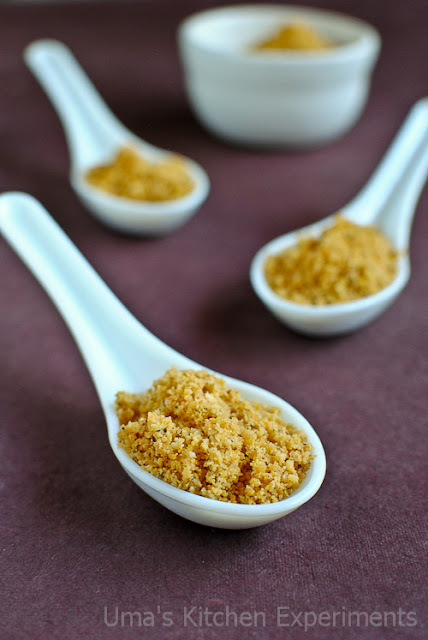 If you don't have dry coconut, you can use fresh grated coconut. Make sure to perfectly dry roast it without any moisture. Also, store in refrigerator for long shelf life. 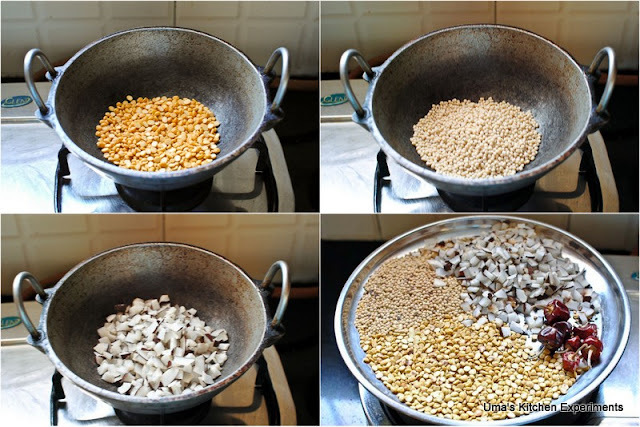 1) Dry roast urad dal and channa dal till it releases nice aroma and turns golden brown. 2) Roast dry coconut slightly just to make them crisp. You can alternately sun dry them for 2-3 hours. 3) Allow all the roasted ingredients to cool to room temperature. 4) Make a powder of channa dal ad urad dal along with dry red chillies first. 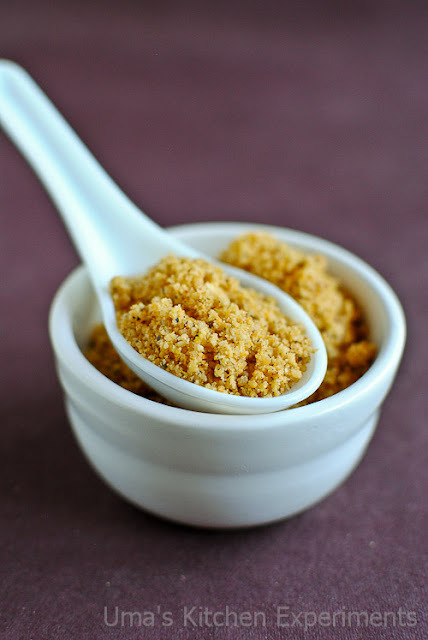 Then, add the dry coconut and make a coarse powder of it. 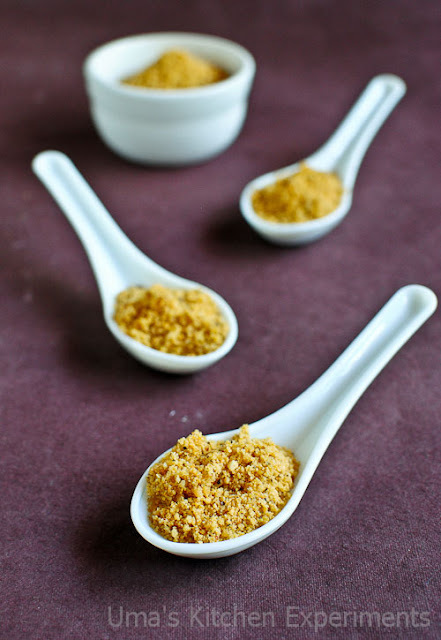 As dry coconut tends to release oil from itself, make sure to add it at last stage of grinding. 5) Add garlic cloves and salt towards the end of grinding. Taste the powder and adjust the salt if required. 6) Store it in dry container and keep in refrigerator for long shelf life. 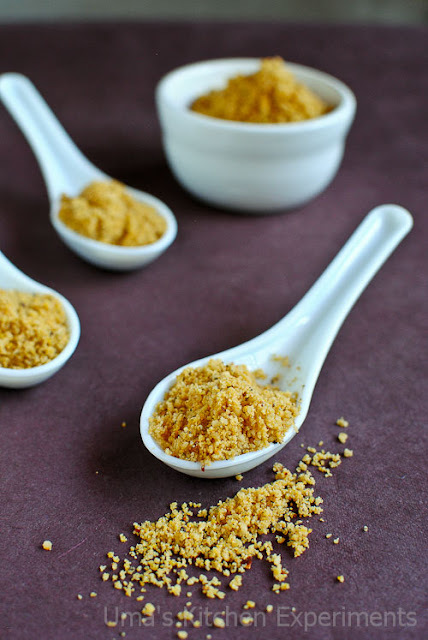 Excellent podi, unfortunately havent made them since a long, wat about ur sister's craft, did she won the first prize Uma. Yes Priya. Yes won under the category of "Innovative Ideas"
Awesome podi. I have never tried making it at home though. I like to have it with curd rice. wow.. nice clicks.. haven't tried this.. how can we use ths? 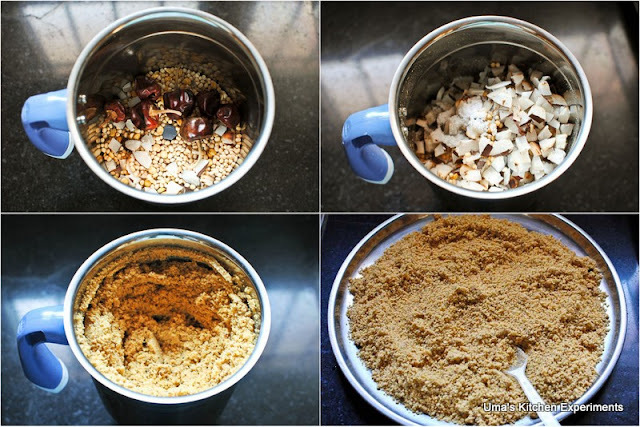 have some dry coconut would try it today...lovely clicks.